The Buick LaCrosse is a large/mid-size luxury car manufactured and marketed by Buick since 2004. The LaCrosse is now in its third generation, slotted above the Buick Regal as the brand's flagship. The first generation LaCrosse replaced the Century and Regal in North America beginning in the 2005 model year, serving as the brand's mid-size car. For 2010, however, the LaCrosse was completely redesigned and moved upmarket as a large premium sedan. Critics have lauded the post-2010 versions for its design, "luxurious interior," acceleration, safety and reliability, while critiquing its small trunk and numb steering on certain models. The LaCrosse debuted in late 2004 as a 2005 model, replacing the Century and Regal. Riding on a revised version of the W-body known as MS2000, the LaCrosse was initially available with two powerplant choices in three trim levels: a 3.8 L 3800 Series III V6 available in base CX and mid-level CXL forms, and a 3.6 L HFV6 V6 in the top line CXS model. Power is routed to the front wheels via a 4T65-E automatic transmission (4T65-E HD on Supers). The name was borrowed from a Buick concept car shown in 2000 referencing the sport of lacrosse. The LaCrosse was originally sold as Buick Allure in Canada, as "crosse" is a vulgar word that can mean either "rip off" or "masturbation", depending on the context in Quebec French slang. The LaCrosse, along with all other GM vehicles powered by the 3.8 L V6, became the first SULEV-compliant vehicles for 2006. The final first-generation LaCrosse was manufactured on December 23, 2008. The LaCrosse received a facelift for 2008. The vehicle's front end design was based on the Buick Velite concept, which was later used by the Chinese LaCrosse. All trim levels received a chrome exterior appearance package, factory remote start feature, XM Satellite Radio, telescoping steering wheel column, redundant steering wheel controls and dual-zone climate control as added standard equipment. CX added a leather-wrapped steering wheel, theft deterrent system, illuminated vanity mirrors, driver information center personalization and more. A Super trim of the LaCrosse debuted for 2008. The LaCrosse Super was positioned as a higher-performance model of the sedan with revised front end styling, as well as a return of displaying four Ventiports under the hood, a rear spoiler, projector beam fog lights, Magnasteer, larger brakes, and revised suspension tuning with standard Stabilitrak. Interior changes included special Super badged cluster with blue face, a wood grain shift knob, and dream weave leather seating. Interior colors for the Super were Platinum and Mocha Brown, while exterior color choices were Mocha Brown Metallic, Black Onyx, Red Jewel Tincoat, and Platinum Metallic. Power came from the 5.3 L LS4 small-block V8 engine featuring Active Fuel Management technology, which is routed to the front wheels. The combination of a V8 and front-wheel drive are not often utilized due to torque steer which is present in any front-wheel-drive car. This powertrain was also found on the Grand Prix GXP, Impala SS, and Monte Carlo SS. The Super model was one of the fastest modern production Buicks ever built, with a factory top speed of 150 mph (240 km/h), and 0–60 mph times of 5.7 seconds. Only the 1987 Buick GNX offered a similar level of performance ratings until the Super was introduced. The LaCrosse Super was discontinued in 2009. The LaCrosse received a Good overall score in the Insurance Institute for Highway Safety's frontal impact crash test and a Marginal overall rating in the side impact test. Injury measurements for the side-impact crash test include a Poor mark for the driver's torso and a Marginal score for the driver's pelvis and leg. Side airbags are limited to the curtain type for both front and rear rows; the torso-type side airbag is unavailable. 2007 models also earned one out of five stars in a National Highway Traffic Safety Administration side-impact crash test. The IIHS also found that the 2006–08 model year LaCrosse had the second-highest fatality rate in the large four-door car class; only the Buick Lucerne fared worse. The CXS was replaced by the Super in the US market for 2008. However, sales of the CXS continued in Canada until January 1, 2008. 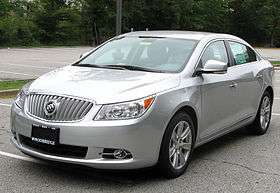 For the 2007 model year, Shanghai GM introduced the Buick LaCrosse as a more upscale companion to its Buick Regal sedan. Designed by Shanghai GM's Pan Asia Technical Automotive Center (PATAC), the Chinese LaCrosse is based on the same architecture as the North American model, but possesses different exterior and interior designs, and a different engine lineup. The car is also built in Taiwan by a joint Yulon-GM venture. In 2008, Shanghai GM introduced a mild hybrid system on the LaCrosse. Using the Belt Alternator Starter system, it is the first hybrid vehicle in the Chinese market as well as the first hybrid in its segment. At first we questioned GM's strategy, not only with the LaCrosse itself but also with the notion of Buick as a genuine competitor for Lexus. But after this comparison [Lexus ES 350 vs. Buick LaCrosse], we have no doubt that the 2010 Buick LaCrosse is a game-changing, brand-defining automobile that will go far to both revitalize Buick and promote the new General Motors. Specifically, the exterior features Buick's "VentiPorts" and the "Sweepspear", Buick styling features dating to 1949. The interior is defined by having "few straight lines and 90-degree joints, if any. Instead, surfaces and controls are rounded, coved, or arched." Mechanically, the new LaCrosse employed a long-wheelbase (LWB) variant of the Epsilon II platform, shared with the Opel Insignia and the 2010 Saab 9-5. The design was based on 2008 Buick Invicta concept, and replaces both the Chinese and North American models. Profile of a 2nd generation Buick LaCrosse, clearly showing Buick's re-introduced, trademark sweep-spear design. Door panel in 2nd generation Buick LaCrosse, showing the new distinctive curvaceous design theme with faux leather cover the entire door. Front of a 2nd generation Buick LaCrosse, showing re-introduced venti-ports. Production of North American models moved from Oshawa to the Fairfax Assembly plant in Kansas City, Kansas, where it runs down the same production line as the Chevy Malibu. Delivery of 2010 year models was delayed a few weeks in order to assure quality control. ...finely detailed, high-quality character. The more you look, the more you see. Throughout the cabin are few straight lines and 90-degree joints, if any. Instead, surfaces and controls are rounded, coved, or arched. Real stitching is used to join seams of the seats, shifter boot and soft material used on the door panels and around the instruments. Chrome and wood trim are used judiciously, tastefully, and the materials in the headliner and upper parts of the cabin look and feel like premium material. The 2.4 L Ecotec four-cylinder replaced the 3.0 V6 as the standard engine on the CX model in the first quarter of 2010. The 3.6 L V6 continues to be an option on the CX and front-wheel drive CXL and standard on the CXS and all-wheel drive CXL. The 2010 Buick LaCrosse CXS is the first North American car to incorporate a front suspension design, marketed as HiPer Strut, designed to improve ride and handling and reduces torque steer. The Buick LaCrosse CXS includes a system marketed as Real Time Damping that adjusts the damping forces of the shocks and struts for improved ride and handling. The 2010, 2012, and 2013 models lacked an interior trunk release mechanism. The trunk was only accessible using the key fob (Remote Keyless Entry) or a touch sensor between the trunk lid and the license plate. The 2011 year model added a remote release button at the left of the steering wheel on the instrument panel. The 2014 model refresh returned the trunk release button to LaCrosse but placed it on the driver door. For 2016, the LaCrosse added a new Sport Touring Edition which included unique 18" aluminum black pocket wheels and a rear lip spoiler. The 2012 Lacrosse features a new mild hybrid as its base model. Dubbed eAssist, the 2012 Lacrosse introduced GM's second generation Belt-Alternator-Starter system. The non-hybrid 4-cylinder is no longer offered. The system consists of a 115-volt lithium-ion battery pack, a 15 kW electric motor capable of adding 15 horsepower of assist while accelerating, and the next generation 6T40 GM Hydramatic transmission with reduced friction components over the previous generation. The eAssist LaCrosse delivers a class leading fuel economy of 25 mpg city and 36 mpg highway. In addition to providing additional power to the 182 hp 2.4-liter 4-cylinder, the BAS-II system allows for engine start/stop operation when the vehicle isn't moving and allows for complete fuel cut off to the engine during deceleration. The LaCrosse was sold in Mexico starting in 2010, as the Buick brand returned to the country after 13 years of absence. The 2nd generation LaCrosse debuted to the Canadian market at the 2009 Montreal International Auto Show as the Buick Allure, and soon after production began, General Motors Canada renamed the Allure to LaCrosse, to correspond with the car's global marketing. GM Canada has offered existing Allure owners the option to change nameplates to LaCrosse. In Quebec French, "la crosse" is slang for "sexual self-gratification", or also a scam. The Alpheon was a localized version of Buick LaCrosse for the South Korean market. Alpheon was a standalone brand from GM Korea. The cars were additionally fitted with amenities such as controls in the rear armrest, mood lights and more. A version of the vehicle (with 3.0-liter V-6 engine, six-speed automatic transmission) was unveiled at the 2010 Busan International Motor Show. Production began on Aug. 9, 2010 at GM Daewoo's factory in Bupyeong, Gyeonggi Province. Market launch began in September 2010. Early model includes a model with 3.0-liter engine (from 2010 Buick LaCrosse) in mid-September, followed by two models each with 2.4-liter engine in October. The Roewe 950 is a licensed restyled Chinese version of the Buick Lacrosse produced by Roewe of SAIC. It is sold alongside the Buick Lacrosse in China, and has a price range similar to that of the Lacrosse. The sheet metal, while similar in appearance, is unique to the Roewe. In late February 2012, the Chinese government took the Buick Lacrosse (along with all other foreign vehicles) off of the list of vehicles approved for government procurement. Though popular among government officials the Lacrosse also thrives via private purchases. Effects on sales remains to be seen. Buick unveiled a revised 2014 LaCrosse at the 2013 New York Auto Show. Redesigned front and rear fascias, new wheel designs, a reconfigurable 8 inch TFT instrument cluster, semi-aniline leather seating, and radar- and camera-based safety features such as Forward Collision Alert and side blind zone alert highlight the changes for this mid-cycle refresh. All V6 models are equipped with the Hydra-Matic 6T70 6-speed automatic transmission. The third generation LaCrosse debuted at the 2015 LA Auto Show as a 2017 model. The all-new LaCrosse rides on the lighter P2XX platform shared with the 2018 Chevrolet Impala which reduced its weight by about 300 pounds (136 kilograms), despite slightly growing in length and width. The car is powered by a GM Small Gasoline Engine and GM Ecotec engine in China for tax credit purposes and by a Fourth Generation GM High Feature engine in North America. The new LaCrosse will also be the first to utilize Buick's new design theme previewed earlier on the Buick Avenir concept. It features a winged waterfall grille inspired by the 1954 Buick Wildcat II concept and a return to using the three-color Trishield emblem. China sales began on March 18, 2016. United States sales are expected to commence in summer 2016. It will be available in Canada fall of 2016. In late 2015, following Holden's decision to terminate its Australian production of the rear-wheel drive Holden Commodore and derivatives based on the GM Zeta platform (including the Chevrolet SS and long wheelbase Chevrolet Caprice exported to North America) from 2017 for good, the Australian motoring media flagged the LaCrosse as potentially being the basis of the next fully imported Commodore. 1 2 Ward's Automotive Yearbook 2005. Ward's Communications, Inc. 2005. p. 115. ↑ "2010 Buick Lacrosse - Review". The Car Connection Review. Retrieved 2016-03-07. ↑ "2010 Buick Lacrosse". New Car Test Drive review of redesigned upscale version. Retrieved 2016-03-07. ↑ "2010 Buick LaCrosse: Used Car Review". US News. Retrieved 2016-03-06. ↑ "Fuel Economy of the 2016 Buick LaCrosse". www.fueleconomy.gov. Retrieved 2015-11-11. ↑ "2011 Buick LaCrosse Review". Kelly Blue Book Editor's Review. Retrieved 2016-03-07. ↑ "2011 Buick LaCrosse: Used Car Review". US News. Retrieved 2016-03-06. ↑ "2016 Buick LaCrosse: Used Car Review". US News. Retrieved 2016-03-06. ↑ "2015 Buick LaCrosse: Used Car Review". US News. Retrieved 2016-03-06. ↑ Arcand, Denis (September 14, 2009). "La Buick LaCrosse ? Un nom pas d'Allure...". La Presse (Montréal). 1 2 Cancilla, Patricia (September 3, 2009). "Buick Allure now LaCrosse in Canada". National Post. Retrieved 2009-09-04. ↑ Nunez, Alex (November 26, 2006). "China's Buick LaCrosse is cooler than ours". Autoblog. Retrieved 2009-09-13. ↑ Neff, John (March 27, 2007). "New York Preview: 2008 Buick LaCrosse gets facelift". Autoblog. Retrieved 2009-09-13. ↑ "'Super' Buicks: The Return". The Crittenden Automotive Library. Retrieved May 5, 2007. ↑ "IIHS-HLDI: Buick LaCrosse". Iihs.org. 2008-11-25. Retrieved 2009-05-09. ↑ Neff, John (February 13, 2007). "Buick LaCrosse shamed with one-star crash performance, receives tweaks". Autoblog. Retrieved 2009-09-13. ↑ 2008 specs Archived October 8, 2008, at the Wayback Machine. ↑ "2008 Buick LaCrosse & LaCrosse Super". GM Media Online. August 1, 2007. Archived from the original on March 1, 2009. Retrieved 2009-09-13. ↑ "2008 Buick Allure & Allure Super". GM Media Online. ↑ "2007 Buick LaCrosse for the Chinese market". Auto Review Automotive Blog. 2006-02-27. Retrieved 2009-07-19. ↑ Ramsey, Jonathon (January 22, 2008). "Buick LaCrosse Hybrid debuts in China". Autoblog. Retrieved 2009-07-19. ↑ Abuelsamid, Sam (January 8, 2009). "Detroit Preview: 2010 Buick LaCrosse breaks cover". Autoblog. Retrieved 2009-09-13. ↑ "Buick LaCrosse 2011 Review". New Car Test Drive. Retrieved 2016-03-15. ↑ "Buick LaCrosse vs Lexus ES 350". Cars for Sale Press Blog. ↑ Korzeniewski, Jeremy (April 8, 2009). "Buick announces starting price of $27,835 for 2010 LaCrosse". Autoblog. Retrieved 2009-09-13. ↑ "GM Delays New Buick Shipments on Quality Concerns". ABC News. September 1, 2009. Archived from the original on September 19, 2009. Retrieved 2009-09-13. ↑ "Buick LaCrosse Overview". U.S. News & World Reports Car Rankings for Buick LaCrosse. Retrieved 2016-03-07. ↑ "LaCrosse Four-Cylinder Engine Offered In 2010 Q1". General Motors. December 17, 2009. Retrieved 2010-03-19. ↑ Steven J. Ewing (March 24, 2010). "Buick LaCrosse drops 3.0 L V6, adds four cylinder". Autoblog. Retrieved 2010-03-24. ↑ "Buick Lacrosse's Innovative HiPer Strut Suspension Delivers Improved Ride And Handling". Media.gm.com. March 24, 2010. Retrieved 2010-06-12. ↑ "2012 LaCrosse Luxury Car Specs and Features". Buick. Retrieved 2012-01-08. ↑ Nunez, Alex (10 Sep 2010). "Buick LaCrosse Vs Buick Regal". Fox News. Retrieved 28 Apr 2015. ↑ "Buick Forum: Opening trunk on a LaCrosse". Buick Forum. Jelsoft Enterprises Ltd. 30 May 2011. ↑ "Understanding the Technology behind the Buick Lacrosse eAssist". CheersandGears.com. 2010-12-05. Retrieved 2010-12-05. ↑ Marietta, Loriana (August 26, 2009). "Buick Prepares Return to Mexico". Edmunds Inside Line. Retrieved 2009-11-19. ↑ "Eight Canadian Premieres at Ford and GM". AutoTrader.ca. January 20, 2009. Retrieved 2009-09-13. ↑ Saporito, Nick (September 3, 2009). "Canada: Buick Allure Now Called LaCrosse". GM Inside News. Retrieved 2009-09-13. ↑ GM Daewoo Starts Production of Alpheon Luxury Sedan in The Chosunilbo, 10 August 2010. ↑ "GM Daewoo Announces Alpheon Luxury Sedan – GM Inside News Forum". Gminsidenews.com. 2010-04-28. Retrieved 2010-06-12. ↑ In-Soo Nam (2015-08-10). "GM Launches Impala in South Korea". The Wall Street Journal. Retrieved 2016-06-21. ↑ Ramsey, Jonathon (February 28, 2012). "China issues list of approved vehicles for government purchase, excludes imports for first time". Autoblog. Retrieved 2012-05-16. ↑ "Buick News – United States – LaCrosse". Media.gm.com. Retrieved 2012-01-08. ↑ Gardner, Greg (2015-11-18). "Buick's 2017 LaCrosse unveiled in L.A.". Detroit Free Press. Retrieved 2015-11-20. ↑ "2017 Buick LaCrosse". GM Authority. Retrieved 2015-11-04. ↑ "NA". wwww.twitter.com/BuickCanada/. Buick Canada. 24 November 2015. Retrieved 17 January 2016. The 2017 #BuickLaCrosse debuts at the #LAAutoShow. Discover the future of Buick Luxury. Available fall 2016. ↑ Dowling, Joshua (19 November 2015). "Buick LaCrosse is the biggest clue yet to the next Holden Commodore". News.com.au. News Corp Australia Network. Retrieved 4 January 2016. ↑ "GM Media Online". Media.gm.com. 2006-01-04. Archived from the original on 2009-03-01. Retrieved 2009-05-09. ↑ "GM Media Online". Media.gm.com. 2007-01-03. Archived from the original on 2007-06-21. Retrieved 2009-05-09. ↑ "GM Media Online". Media.gm.com. 2009-01-05. Archived from the original on February 21, 2009. Retrieved 2009-05-09. ↑ "GM U.S. Deliveries for December 2010 – Divisional Brand Level" (PDF). Retrieved 2012-01-08. ↑ "Sales: December 2011 – General Motors – Cheers & Gears: Forums". Cheersandgears.com. 2012-01-04. Retrieved 2012-01-08. ↑ "GM U.S. Deliveries for December 2013" (PDF). General Motors. 2014-01-03. Retrieved 2014-01-06. ↑ "GM Deliveries up 19 percent in Blockbuster December". General Motors. 2015-01-05. Retrieved 2015-01-08. ↑ "GM, Chevrolet Lead with Industry's Largest Retail Market Share Increases of 2015". General Motors. 2016-01-05. Retrieved 2016-01-07. Wikimedia Commons has media related to Buick LaCrosse.